The Woodpecker and Robin module need the main power supply available in the S3 state. If the baseboard switches the main power supply, the SUS_S4# (equal to SUS_S5#) signal needs to be used in order to switch the main power supply. Some competitor baseboards are using the SUS_S3# instead of SUS_S4 in order to switch the main power on. The Robin and Woodpecker modules can be used with such baseboards, but the S3 Signalization Mode setting of the Embedded Controller needs to be changed from Normal to S3 Signal Together With S5. A description of the respective Embedded Controller register can be found in the datasheet of the computer modules. If a Windows XP based OS is used, the Toradex Z5xx Tweaker Tool can be used in order to change the setting. In the normal mode, the module ramps the power up as specified in the power up sequence in the datasheet. 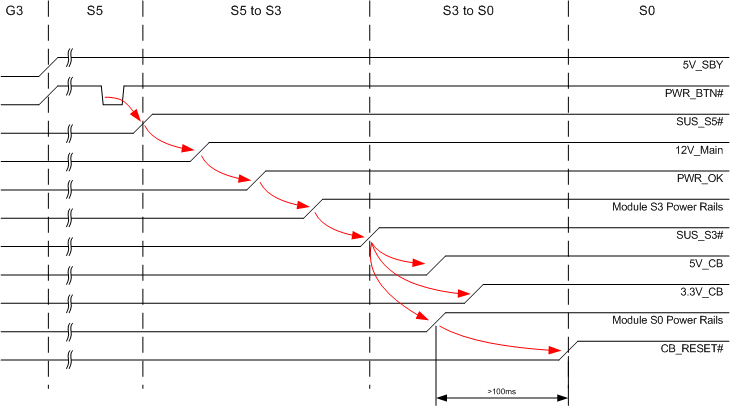 In addition to this described sequence, the module have a fall back mode which allows it to boot a module in the normal mode on a baseboard which switches the main power with the SUS_S3# signal. If the module does not get the PWR_OK signal from the baseboard or the main power supply is not available within 10 seconds after releasing the SUS_S4#/SUS_S5# signal, the module releases also the SUS_S3# signal. If the PWR_OK and main power is not available within another 5 seconds, the module shuts down. This time corresponds to the documented 15 second time out. Important: The fall back mode is designed to power up a module if SUS_S3# is needed for the main power in order to allow to change the S3 Signalization Mode then. The fall back mode should not be used permanent, since it increases the power up time by 10 seconds and the module crashes if it goes into a normal stand by S3 mode. 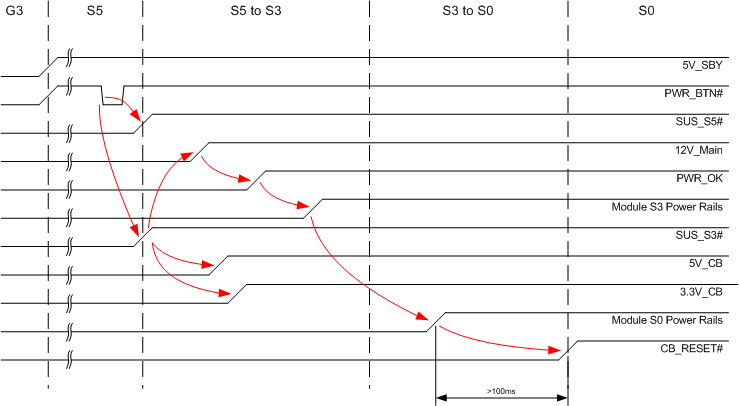 In this mode, the module switches the SUS_S3# signal together with the SUS_S4#/SUS_S5# signal. In this mode, the module can be used on baseboards that uses the SUS_S3# signal for switching the main power voltage. The sleep mode (S3) is working in this mode but the baseboard might does not switches off not required peripheral devices. This increases the power consumption of the system in sleep mode. 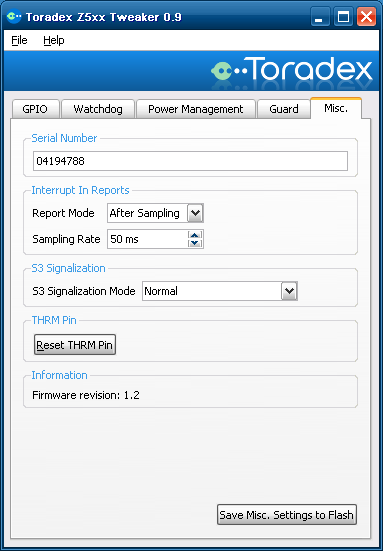 Therefore, this mode should only be used if the baseboard requires the SUS_S3# signal for switching the main power. Customer should use on their own carrier board designs the SUS_S4# signal for switching the main power or should not switch the main power at all.